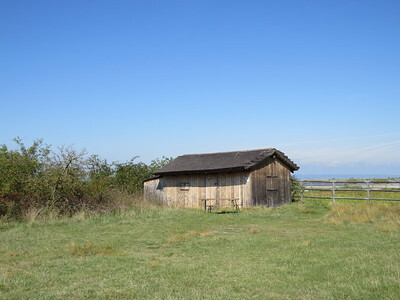 Fertö/Neusiedlersee Cultural Landscape is the result of the symbiotic process of human interaction with second largest steppe lake in Central Europe. Traces of human settlement around Lake Neusiedl go back to the neolithic period. The area became densely populated from the 7th century BC onward, initially by people of the Hallstatt culture and remained so throughout Roman times. The designated area comprises of the settlements of Podersdorf, Illmitz and Apetion, parts of Rust and Fertörákos, the Palace of Nagycenk and Fertöd Palace. Most of the lake is surrounded by reeds which serve as a habitat for wildlife (making the lake an important resting place for migratory birds) and are harvested in winter as soon as the ice is solid enough. The Neusiedlersee (Fertö tó in Hungarian) is a saline lake about an hour east of Vienna. It’s on the WH List as a cultural landscape. “A combination of stockraising and fishing with viticulture beside a lake” seems to be its core value. This is a fairly well-visited site among WH travellers, and the general public also knows how to find it as shown by an annual visitor count of over 700,000. In preparation of my visit I tried to find some things to see or do that haven’t been described on this website before. I will leave the omnipresent vineyards for what they are, but focus on the reed and vernacular architecture. I started my visit in the town of Mörbisch, at the west bank of the lake. The nomination file applauds its “characteristic oblong farmsteads and narrow lanes leading down to the Lake”. My car navigation however delivered me at a huge parking lot at the "Seebad" (Lakeside Resort), without anything particularly interesting to see en route. I had chosen this town mostly for its transport link to the other side of the lake. Every half hour a bike and pedestrian ferry starts the round-trip, and I thought this would be a nice alternative lake cruise. The trip takes only 20 minutes, and most of the action comes from the private sailing yachts navigating the lake. The ferry supposedly drops you off at Illmitz, although the town itself lies a few kilometers inland. Here’s where a bike would have come handy, as it would bring both Illmitz and its acclaimed Neusiedler See visitor center within reach. A broad straight road leads out there. I had no other option than to go on foot. Dense reed surrounds this road on either side. Glimpses can be caught of a couple of smaller lakes and channels, with waterfowl species floating around remarkably similar to those in my backyard in Holland. Locals used the reeds in an elaborate fishing method called "Vejsze": a labyrinth of reeds was created to trap the fish. Reed was also used for roof cladding. Although the nomination file suggests that the latter still is a common practice, I saw my only two buildings with thatched roofs near the bird hide on the way to Illmitz. I never made it to the town itself by the way, it’s definitely too far to walk in the sun on a boring road. After Mörbisch and Illmitz I got back to my rental car and drove on to Rust. This is where the wealthy winemakers lived. Rust's citizens received market rights in 1470 and the privilege to mark the corks of their wine barrels with the famous 'R' brand in 1524. Rust (together with the rest of this ‘Burgenland’ area) only became part of Austria in 1921: before that this mainly German-speaking region belonged to Hungary. It is a lively (and touristy) town, with a small but neat historic city center. Every other house still seems to be in use as a part of the winemaking industry. The local Fishermen’s Church is worth a look for its odd shape, historic altar and murals. The nomination history of Fertö/Neusiedlersee shows a giant U-turn just before inscription in 2001, one that seems hardly possible in these days. It was originally nominated as a mixed site. Its natural values featured prominently in the dossier, but were rejected at the Bureau session. The lake was deemed unique on a European scale, but not globally. Also, the lake regime is somewhat artificial as the water level is controlled by a sluice. The regular use of chemicals in the modern viticulture methods does not help its natural values either. But the Advisory Bodies did see possibilities for a cultural landscape. However, in that case the core zone would have to include the towns surrounding the lake (which were mostly placed in the buffer zone in the first nomination centering on the lake itself). This was changed in the final nomination, though the UNESCO website still shows the old map. Towns such as Mörbisch, Oggau, Donnerskirchen and Purbach with their fields and field systems are now included. Essentially this change has left us with yet another viticulture landscape WHS, which is pleasant enough to visit on a sunny day but will not make a lasting impression on the seasoned traveller. I visited this WHS in August 2015. I visited more of the Austrian side than the Hungarian side of this WHS but the highlight of my visit was crossing the invisible border with a self-drive boat. The Hungarian side is less crowded and the reeds seem to have taken over the lake bed here, which means that it's the best spot for birdwatching. I spotted a couple of hoopoes, herons, egrets, storks, black kites, reed warblers and black kites. By car I circled the Neusiedlersee coming from Vienna and stoppen en route in Neudiedl am See, Jois, Winden am See, Breitenbrunn, Purbach, Donnerskirschen, Schutzen am Gebirge and Rust. In Breitenbrunn I found an information board on the WHS as well as the UNESCO sign. Rust is a very quaint village home to several storks. There are two churchs and an interesting old chapel as well as beautiful wooden doors adorning the many wine cellars and inns. Access to the lake is a long walk from town with reeds on both sides of the road which leads to a small pontoon. From here hourly boat trips take you round the lake for 8 euros or else you can hire a self-drive boat. I opted for the latter as I wanted to explore the reed beds for birdwatching. The only 'sight' apart from a panoramic flat reed landscape is the village of Rust and its vineyards (picture). After a pleasant ride, I drove to Eisenstadt to visit the Esterhazy Palace and afterwards I took a little detour to see the Forchtenstein Castle once I was in the area even though it's not part of the WHS. All in all, I enjoyed my visit as a stopover on my way back home from Vienna. My circumnambulation of the Austrian part of the lake was similar to Hubert's, but instead using trains, buses, ferries and foot power. The best vantage points for seeing the lake appeared to be from the upper deck's of the ferries. 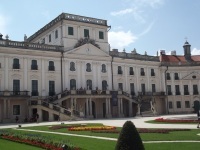 I also visited the sumptuous Esterhazy Palace in Fertod on the Hungarian side. An Austrian train links both sides of the lake to Fertoszentmiklos on the Sopron to Gyor line. The visit was accompanied by entertainment provided by a string quartet. Lake Neusiedl is a shallow steppe lake without large natural inflows, its water balance is determined almost exclusively by evaporation and rainfall. It's amazing that the water depth is nowhere more than about 2 meters. The lake is very young, it was formed about 13,000 years ago by tectonic movement. The lake is almost completely surrounded by a reed belt that is the habitat for rare animals and the breeding area for many migratory birds. In particular, the lake is attractive for bird watchers, but is also popular with sailors and sail boarders. The special climate - many days of sunshine, mild climate in the fall - provides ideal conditions for wine growing. 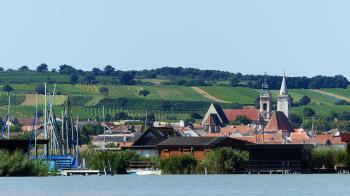 There are many vineyards around the lake and both, red and white wines are excellent. I think the inscription is justified both for cultural and natural criteria. The best way to explore Lake Neusiedl is a bicycle tour. We started our day tour in Rust and cycled around the entire Austrian part of the lake (a total of approximately 80 km). In Morbisch we took the ferry to Illmitz, the ferry is only for cyclists and hikers. 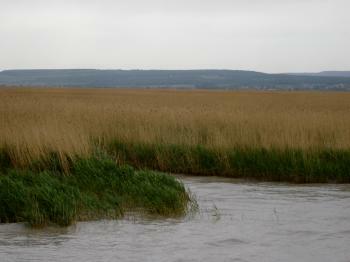 During the crossing we've got a good impression of the dense reed belt, nowhere you can see a real shoreline. On the east side, the so-called Seewinkel, the cycle path leads through an area with many small saline lakes. We've seen a lot of birds and there are several look-outs, from where you have nice views over the lake and the surrounding landscape. Unfortunately, the headwind was very strong and sometimes it was hard to get forward. We had a first larger break in Podersdorf. Here is the only part of the lake where the reed has a gap and you have access to the lakeside. In Podersdorf is also the pier for tour boats. On the west side of the lake the reed belt is larger, in some areas it is several kilometres wide. The cycle track passes through some lovely towns with typical wine cellars, like in Breitenbronn and Purbach. There we had a few breaks and we sampled the local wine. We stayed overnight in Rust, the most beautiful town at the lake, with many wine taverns and inns. On a day trip from Vienna we travelled to Rust, by far the most famous resort aside the Neusiedlersee. It has a beautiful town square which makes most of the town. You can view some storches nests on the chimneys and buy local wine and pumpkin. Rust also has views of the famous reed steppe and the birds which attend it. You can also hike for 20 minutes to a beach. I was somewhat disappointed there is no spot where you can have a clear panorama of the lake but later found out this is true for all of the towns along its shores. This is the result of both the hight reed and its ever changing form. I certainly agree with one of the reviews I read that although the Neusiedlersee constitutes a unique environment which is the result of human interaction with nature, it is very difficult to experience this on your visit. Still it is a very nice rural area and worth the trouble of coming. I must admit that Ferto/Neusiedlersee deserves to be the WHC place. Nevetheless, it is a bit difficult to recognize its quality: small villages and large palaces scattered in the flat landscape surrounding the shallow lake. The only way how one can admire the overall scenery of the site is standing on the ridge of hills located on western side of the lake. Lake Neusiedl is a popular tourist destination for Austrians, the so-called "Sea of the Viennese" for all kinds of water sports and other recreational activities. It is also a cultural landscape worth visiting, especially the charming little town of Rust and the Esterhazy Palace in Fertöd, known as the "Hungarian Versailles". The site is also well known for its natural qualities, especially the almost Asian steppe areas and the birdlife, since many species from Europe have the easternmost point of their range here, and many Asian species their westernmost. Together with the natural reserves on the Hungarian side, the site is one of Europe's premier birdwatching areas. As far as I know, it was originally nominated as a mixed site for both cultural and natural criteria. Why UNESCO chose to accept only the cultural criteria, I don't know. From "Cultural Landscape of Fertö/Neusiedlersee" to "Fertö/Neusiedlersee Cultural Landscape"
Site was proposed as mixed site, but at Bureau (after ICOMOS, IUCN evaluations) it was suggested to drop the natural nomination and come with further documentation on the cultural aspects. Core zone was extended too, to include more villages. Vernacular architecture: "The remarkable rural architecture of the villages surrounding the lake "
Cultural sites rejected for Natural criteria: "Although the site was originally nominated as a mixed site, the Committee did not inscribe Fert?/Neusiedlersee on the World Heritage List under natural criteria. "